The oldest known ancestor of Tyrannosaurus rex has been discovered in southern Utah, throwing light on the evolutionary history of the famous predator, and providing crucial clues to the puzzling diversity of dinosaurs throughout the Ancient West. The fossil of the new-found species, unearthed in Grand Staircase-Escalante National Monument, dates back some 80 million years, predating the heyday of Tyrannosaurus rex by about 10 million years. 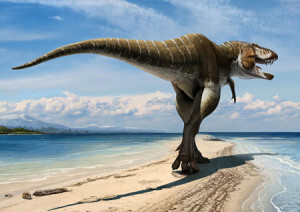 But scientists say they were surprised to find some striking similarities between T. rex and its predecessor, indicating that some of the tyrant-king’s most beneficial traits actually appeared eons earlier than had been thought. Bestowed with a name that will no doubt delight filmmakers and toy manufacturers — Lythronax, from the Greek for “king of gore” — the new dinosaur is the earliest member yet found of the tyrannosaurids. These were the hulking, two-legged carnivores that include not only T. rex but also its lighter, longer-nosed cousins found farther north, like Albertosaurus and Gorgosaurus. 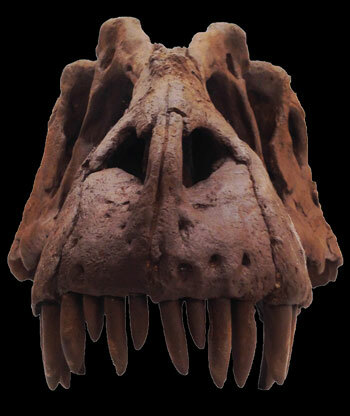 “The width of the back of the skull of Lythronax allowed it to see with an overlapping field of view — giving it the binocular vision — very useful for a predator and a condition we associate with T. rex,” said Dr. Mark Loewen of the Natural History Museum of Utah in a statement. Loewen and his colleagues announced the discovery of the tyrannosaur fossil today in the journal PLOS One. And this insight sheds light on another, even more perplexing problem in Western paleontology: the differences that keep showing up between dinosaurs in the north and those in the south. “Lythronax may demonstrate that tyrannosaurs followed a pattern similar to what we see in other dinosaurs from this age, with different species living in the north and south at the same time,” said Dr. Joseph Sertich of the Denver Museum of Nature and Science, a co-author of the study. It’s long been noted that dinosaur species of the same family often bear different features across a geographic range, with southern animals sharing unique traits compared to their northern contemporaries (See, for example, the bull-horned, big-nosed ceratops recently found in southern Utah). Geology shows that most of the West at the time, between what’s now the Great Plains and Pacific Coast, was in fact its own continent — a sort of superisland that scientists call Laramidia. But if all of these dinosaurs lived on the same island, why are their differences so pronounced? Members of Loewen’s team think that Lythronax may help provide some answers. 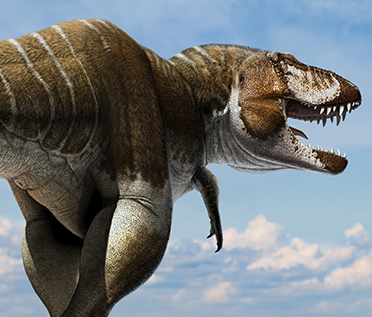 The obvious similarities that it, the earliest known tyrannosaurid, shares with T. rex, the youngest of its kind, indicate that tyrannosaurids must have diverged from earlier tyrannosaurs before Lythronax‘s time some 80 million years ago. What’s more, this diversification may have been followed by a period when, according to the geological record, sea levels were at their highest. These high waters may have stranded the southern tyrannosaurids, and presumably other dinosaurs, in pockets of lower Laramidia for tens of millions of years. “The incursion of the seaway onto large parts of low-lying Laramidia would have separated small areas of land from each other, allowing different species of dinosaurs to evolve in isolation on different parts of the landmass,” said co-author Dr. Randall Irmis, also of NMHU. While this hypothesis may address some questions about the development of Western dinosaurs, the team acknowledges that major gaps remain in the evolutionary history of Tyrannosaurus rex and its relatives. 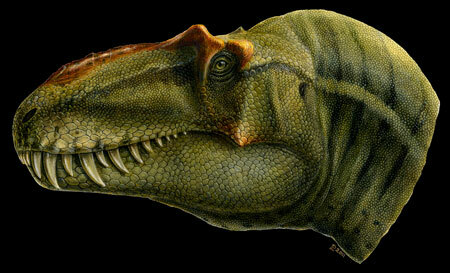 “There are a lot of undiscovered tyrannosaurids out there waiting to be found,” they conclude.